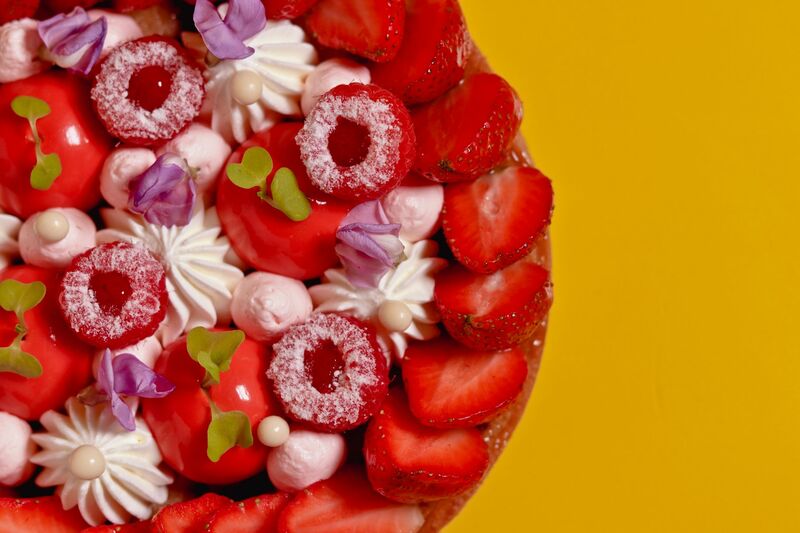 Lauded pastry chefs, Miko Aspiras and Kristine Lotilla of Tasteless Food Group created these stunning recipes for our readers so that home-cooks can impress their guests! Challenge yourselves and give them a go! Have you ever wanted to create a picture perfect dessert from scratch? Now’s your chance! Top chefs, Miko Aspiras and Kristine Lotilla have created recipes that the home-cook can attempt. Mind-you they are a tad bit challenging but, why not give them a go! Notable pastry chef Miko Aspiras (Gen T lister) partnered with chef Kristine Lotilla and have since been perecting pastry. They are the team behind Tasteless Food Group’s many yummy dessert concepts. These two are the dynamic duo behind Scout’s Honor, Le Petit Souffle, Workshop, and Poison doughnuts. Miko and Kristine have been collaborating to craft mouthwatering, sinfully delicious desserts since the day that they met! Acclaimed chef, Miko was the first Philippine representative to compete at both the 2018 SIGEP Gelato Convention as well as the Valrhona Chocolate Chef Championship. He is a keen competitor who loves to join international contests, showing off his chops. Miko also presented at Madrid Fusion 2016, and at the Manila convention that same year. When not competing internationally or checking in on his many concepts with Tasteless, Miko bakes for fun, loves to travel and watch a good movie or TV show. This young talent is also Philippine Tatler T.Dining’s Best Pastry Chef for 2018 is currently working on writing two cookbooks. Make a caramel out of the remaining 100g sugar using a heavy bottomed sauce pot. Cook down the sugar over medium-high heat until it caramelises. If you do not have a round cookie cutter, you may opt to cut the puff pastry into squares using a knife, you may also cut the mango tatin the same way too. Purchase pre-baked crust from the grocery (8 inch prebaked store-bought pie crust). Instructions for making the strawberry "mousse"
Using a planetary mixer (kitchenaid) paddle the butter, sugar together until light and fluffed up. Prepare the crust by spraying non stick canola oil or rubbing some butter on the bottom and sides of the crust. Tell us more about yourself and your partnership with Miko? “Miko and I met up in Fairmont and Raffles Residences. He was my Chef de Partie and I was starting out my career as a fresh grad. We had the same shift and worked there for 2 years until Miko asked me if I wanted to put up a business with him. On November 2014, we started working with Tasteless Food Group where we put up our first business, Scout’s Honor, in Hole in the wall. Put gelatine sheets in ice cold water and let it soften. In a pot, place milk and sugar and heat up the mixture till hot. Remove from heat and add softened gelatine sheets -- wait until it melts. Mix and lastly, add cold cream to lower down the temperature of the mixture. Puree kiwi using a blender and put in a pot together with water, lime juice, and sugar. Put gelatine sheets in ice cold water and let it soften. When softened, melt in microwave. Puree avocado with condensed milk and lime juice. Add melted gelatine sheets in mixture and mix with the avocado mixture. Pour milk panna cotta at the base of your glass and place in the chiller till it sets. When it is hard enough, add the kiwi compote and return to the chiller till it sets. Then do another milk panna cotta layer then let it set. Tilt the glass to the right and place avocado mixture and let it set firm. While still tilted, pour another milk panna cotta mixture and let it set in the chiller the same way the avocado mixture was tilted. When it holds well enough, put it on a flat surface and then pour in the avocado mixture and let it set again. Lastly, place kiwi mixture on top of the avocado mixture. Pipe remaining avocado mixture on top, fresh kiwi, chocolate sheet, and mint leaves as garnish. *Everything except for gelatine sheets can be purchased at any grocery store. Gelatine sheets can be purchased at Santis.